The design of the automatic PPR/PVC packing line is completely based on user’s actual manufacturing needs. It is an PPR/PVC pipe bundling machine, pipe strapping machine, pipe bundle packing machine which aims to provide on line plastic packing solution. It is realize the following aspects. 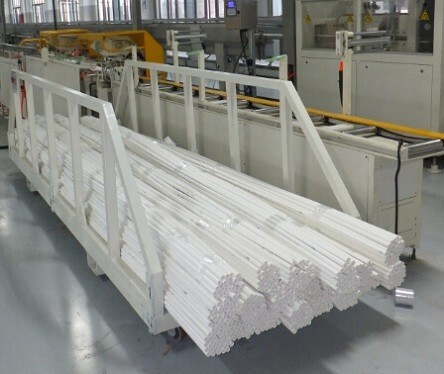 One offline bundling machine is able works for 3-6 extruders for making the bundle. The handling speed is Max.36000 PCS pipe per day. Strapping head can be choose per speed requirement. The online machine connects to the extruder for automatic gathering the pipe, counting, bundling making. One extruder per online bundling machine. 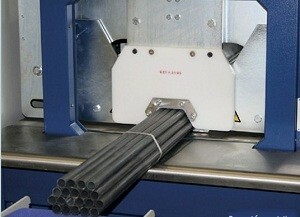 The pipe packing system is able online/offline with extruder for pipe counting, bundle making, strapping and bag filling. 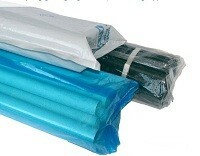 The system can be designed per different bundle size, different bag material. This automatic PPR/PVC packing line will have high reliability and low maintenance by optimizing the whole design and using reliable components. Packing line is able to design according your packing requirement. It is a set of efficient, convenient and safe wrapping machinery for pipe, pipe bundle packaging. We have made efforts in the following aspects to realize easy maintenance. First, we standardize the design with complete spare parts list. Second, we continuously improve the monitoring software intelligence. By such improvement, the monitoring software can automatically check and find out the accurate position of machinery failures, and alarm audibly and visually. This is an effective way to improve self-checking ability and promote maintenance operators’ efficiency in discovering and solving machinery problems. which means that every processing position can open or close freely. The machine can be online packing. It reduces unnecessary waiting time. This automatic PPR/PVC pie packing line has been successfully applied in different plastic pipe enterprises and different production lines. Continuous improvement and development make it reach a high technical level. The equipment is for feeding (on line/off line) and counting the number of pipes before bundling. a) Control by PLC program. b) Sensor for positioning and detecting. c) It is adjustable per pipe size. d) Precise pipe counting and feeding system. The pipe bundling machine includes automatic pipes aligning, stringing, strapping system. a) Excellent collections. Well-known brands are adopted for main components. b) Ring speed adjustable by converter. c) Roller speed adjustable by converter. e) Manual and automatic working mode can be choosing. f) Pipe aligning device for keeping the orderly tip. g) The pipes are parallel without cross. i) Stringing device adjustable per size of the pipe and bundle. j) Automatic strapping for stringing pipes. k) Strapping belt is adjustable per requirement. m) The pipe bundling machine is adjustable for different pipe length. n) Pipe are paralleled in strapped bundle. c) Automatic bundle package outlet.